You can read about Day 1 here or Day 2 here. Day 3 was a Sunday and we didn't have any timed events on the agenda for Sunday, so we got up and slowly got ready. One of the girls wanted to go to church so she had picked one out online the night before that she thought would be nice. 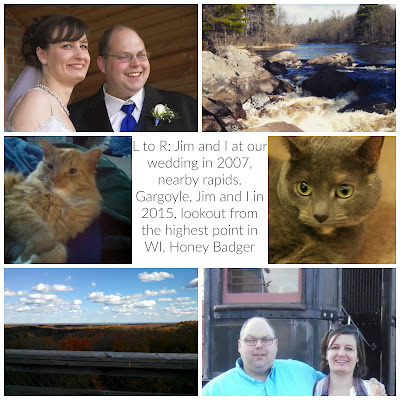 We were all ready in plenty of time, so we got in the car and set out for Alger Falls, which is right outside of Munising, right on the side of the road and on the same side of town we were currently in. I actually drove right by it the first time, because I didn't remember it being so close to the edge of town but we found it with relative ease and it was nice to see it with the sun just rising up over the top of the falls. So we snapped a couple pictures and then headed to church. We went to Munising Baptist Church which was relatively easy to find once we stopped listening to the GPS that didn't know where it was going. Church was nice, everyone was very friendly and welcoming, the music was good, the pastor did a great job delivering a message that was relevant and his preaching style held your attention. Basically, everything you hope for when you go to church. After church we had lunch at The Dogpatch which had some sort of Li'l Abner theme going on which I didn't really get since Li'l Abner ended many years before I was even born. But, my BLT was good and the waitress was nice so I guess that's the main thing. 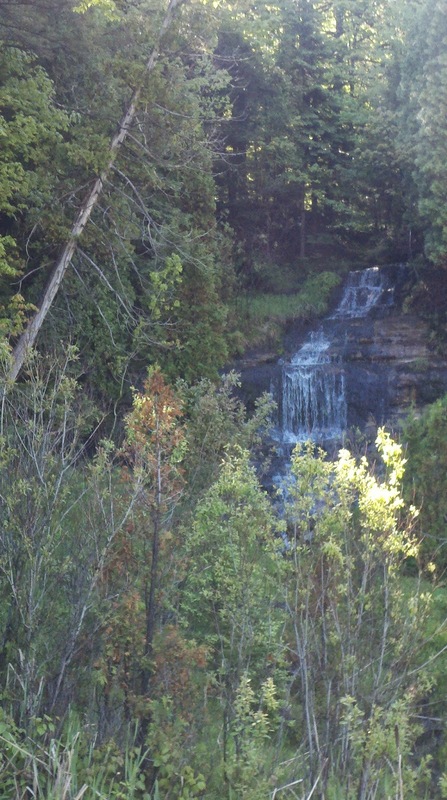 Munising Falls is just outside of town and very easy to get to. There's a parking lot, public bathrooms, and a very nice trail right up to it. 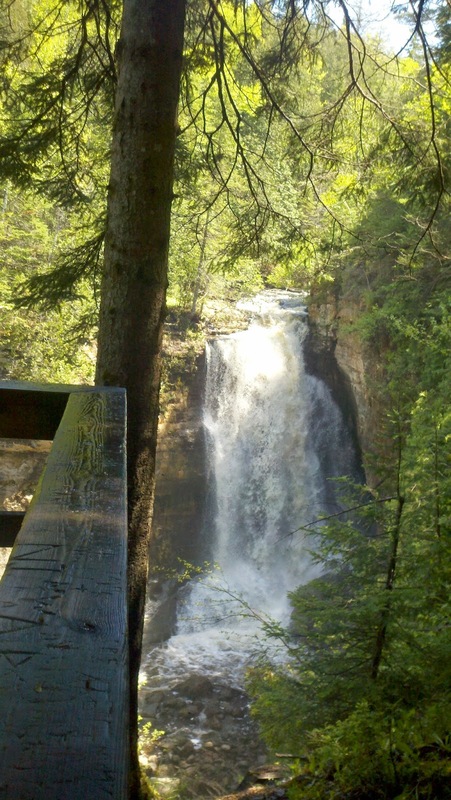 Miners Falls is a little bit more of a drive and you'll be well out in the country, but I'd say it's worth it. You can't get very close to it unless you want to make your own path. But, the mosquitoes were thick so we just stayed on the trail, snapped a couple pics and headed on our way. 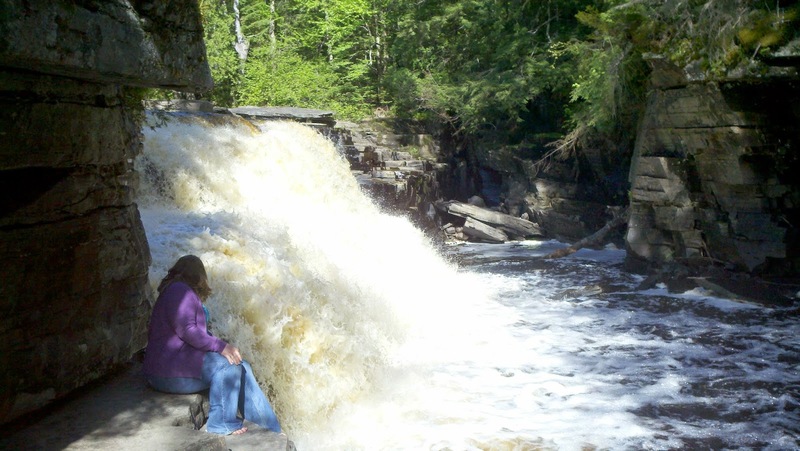 By this time it was mid afternoon, and we debated hitting some of the other falls in the area or heading back to Baraga where we had reservations for the night, and was about a two hour drive away. In the end we decided to head out and just stop at a couple of the scenic overlooks on the way. We drove pretty much straight through except for one stop at Starbucks in Marquette due to one cranky driver needing caffeine (me) and one car sick passenger. Feeling slightly revived we continued on. 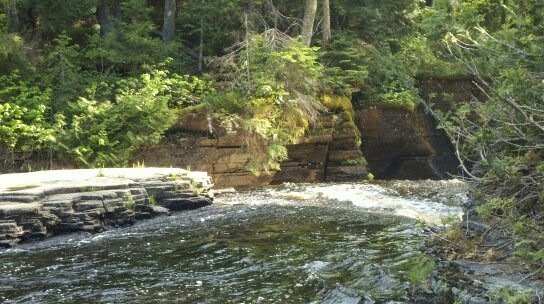 About fifteen minutes before we hit Baraga, we stumbled upon Canyon Falls. There's a park for it right off the main road and then a nicely groomed path right down to the gorge. I had been here once before and remembered it as a nice falls so I stopped, woke up the girls who were sleeping and we headed out. 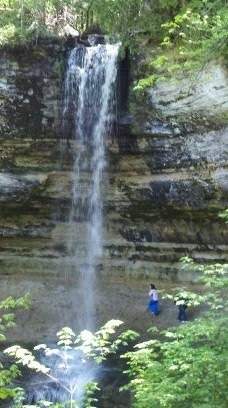 This falls are in a gorge and the rock has this neat striation. You can get down right next to the falls. And there's wild flowers growing up everywhere- along the trail, in the crevices, it's pretty awesome. Canyon Falls has to be one of my favorites. It's easy to find, easy to get to, you can get really close to it, and it's just full of natural beauty. Even without the falls I would consider it very picturesque. After our visit we all felt soothed and calm. We checked into our motel, the Baraga Lakeside Inn. It's right on Lake Superior (and there were still some ice chunks floating in the bay!). It has an inside pool and sauna which is part of the reason I booked there. I figured after all the driving we could use a relaxing night before heading home in the morning. Everything seems to close up early in Baraga, but we were able to snag some dinner at the Baraga Drive In, which had decent food and it was kind of fun to eat in the car and have the waitress bring us our food and drinks. The service was good and we all liked the retro feel of the place. After dinner, we headed back to the motel swam a little, sat in the sauna for a while and then pretty much went to bed.